Whether you like it or not - agree with it or despise it - bullfighting exists in Spain and is an important part of their history and culture. Just because we have written about bullfighting, it does NOT mean to say that we like it or agree with it. We are merely journalists, reporting on how it happens. The practice of bullfighting could be seen as cruel and a poor form of entertainment. The outcome is guaranteed at the onset and the procedure is barbaric. The cruelty and suffering to the bull is unacceptable to many people. 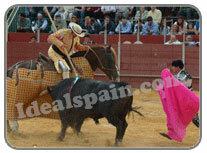 Spain has always been famous for its bull-fights as have other countries all over the world.. In Spain the bullfight is called the Fiesta Nacional (The national Sport). There are few places in Spain where a bull-ring can't be found within a short drive. It is the most common thing associated with Spain, and rightly so for its origins date back to 711AD when the first bullfight (corrida) took place in honour of the crowning of King Alfons VIII. Every week, all over Spain, many thousands of Spaniards flock to the nearest bullring, but not all Spaniards agree with the sport, or like it. Bullfighting has now been banned in Catalunya and it is likely that other regions will follow suit. It has been reported that this ban will result in thousands of jobs being lost and large sums of compensation being paid to bull breeders. 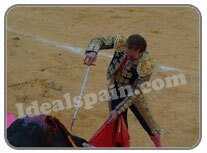 It is reported that each year, within Spain, 24,000 bulls are killed in front of an audience of 30 million people. 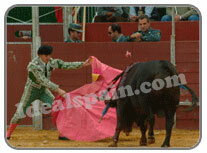 The bullfighting season runs from March to October. Bullfighting was originally done on horseback and was a sport reserved for the aristocracy. This changed when Felipe V prohibited the nobles from practicing the sport as he felt it was a bad example for the public's education. From then on the commoners took on the sport, facing the bulls unarmed, dodging and taunting the bull then eventually placing small spears into the bull, the origin of the banderillas of today's bullfights. Around 1724 the sport was transformed from horseback to foot. The bullfight is literally a dance with death. The bullfighter has to carefully examine and study the movements and strengths of the bull. One wrong move and he will end up gored or seriously injured. Bullfighting is also done on horseback. It's an excellent display of horsemanship yet the outcome is just the same. See our video below, but please read our statement first. Want to see the bulls' revenge? It is certain though that at the end of the show, the bull will die, yes, it is literally a show. The bullfighter has to demonstrate his skills to the audience in a dramatic and enthusiastic way. If he makes a good job of it and gets a good round of applause at the end he could be bestowed the ultimate honour by being presented with one of the bull's ears or its tail. If he has been really good he may even be carried round the arena. One variation of the traditional bullfight is bull-running where bulls are released into the streets and masses of participants do their best to avoid them and stay alive. Pamplona is the best place to see this. Depending on who is starring in the bullfight, tickets can be rather expensive. There are several prices, depending on where you sit. Despite the fact that we hold no attraction for bullfights, living in Spain we had to witness at least one. Our first experience was several years ago, at Marbella bullring where we watched a farce provided purely for the tourists and it was embarrassing to say the least.. Our latest visit was to a smaller venue in the Spanish village of Coín where the bullfight was staged for the locals and not tourists. The experience was very different. The ring consists of about 8 entrances. When you buy your ticket you specify if you want to sit in the sun or the shade. The shade is more expensive. This dictates which entrance you will enter by. The cheapest seats are at the top of the ring, the front seats are the most expensive. Take a cushion with you as we did, or pay 1 euro to rent one, or sit on the concrete seats. The show started at 7pm with a parade of the bullfighters, then once the president is ready, in his special box, the first bull is let in. For about 15 minutes the bull is tormented by several Picadors, two of which place spears in the bull's back to weaken him. Then the Matador enters the ring, fights the bull then finishes him off with his sword. The Matador is then presented with an ear of the bull for providing a good show. In all, the Corrida that we watched consisted of four bulls, all who put up a good fight. It was most amusing and quite rewarding when one of the bulls got the better of the Matador and drew blood as he tossed him into the air. (good on the bull). You will be able to buy drinks in the ring as well as programmes. Also available are roses to throw to the Matadors. Best to take your own drinks, a hat and your sunglasses ! It was a very Spanish affair, true culture. It was different to say the least but not as exciting or as gory as we imagined. 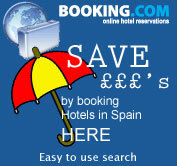 We are however pleased to have sampled it and pleased to be able to share it with you; a real Spanish tradition. One of the oldest bullrings in Spain is located in the hilltop village of Ronda in Andalucia, southern Spain. It is the venue for one of the most spectacular corridas of the year. In early September the ring hosts a week-end of bullfights in celebration of Pedro Romero, the Saturday corrida being staged in Goyesc costume for which tickets are very hard to obtain. The bullring in Ronda is open to the public, with a small admission charge. The bullring also houses an interesting museum dedicated to the sport. Take a closer look here.